ladyada continues to produce more and more interesting Arduino shields. 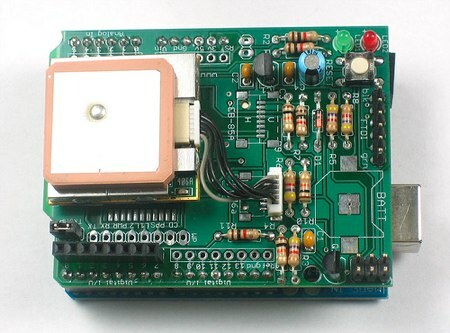 This new GPS logger plugs into a standard Arduino board and has support for four different GPS receiver modules. On the backside of the board is an SD card slot where it stores the coordinates in a text file. The total runtime can vary from five hours to twenty depending on how you choose to power the device and how you use the device. How often you read the device and whether you maintain the GPS lock will affect the power consumption. Like all of ladyada’s projects, you’ll find a great construction guide and example code on her site. Great idea, couldn’t this also be combined with a hacked eye-fi card to become a tracker? @blizzarddemon: That wouldn’t work (the Eye-Fi is just wifi, and for most applications, you won’t have Wi-Fi along the whole way)…however, you could use a cellular data modem stacked on top of that–that would work perfectly. @gazoogleheimer Oh Im not saying its %100. No wifi, no upload, but it’d be a cool idea to try anyway. Alot cheaper then spending the $500+ on a tracker. @BlizzardDemon – you could trick the eye-fi card by “faking” a JPEG write to the card and putting the info in there, but that still wouldn’t really work because the eye-fi card needs an open or already-setup hotspot to upload images/data from. if you want to do a diy tracker, get a cheap cell phone (google or search here for for the projects that use that). Shipping that to Europe? Looks like a bomb.